The top markets had another stable month of stable rents with the three most expensive one bedroom prices all remaining flat. The top 25 cities had the least movement in rankings, whether up or down, when compared to the rest of the nation (rankings 26-100). Overall, the national one bedroom rent dropped 1% to $1,243, while two-bedroom prices increased a slight 0.2% to $1,391 last month. Notably, one bedroom rent is up 8.8% since this time last year. 1) San Francisco, CA, though holding onto its position as the priciest city in the nation, saw another month of steady rents. One bedrooms remained flat at $3,400 and two bedrooms increased a slight 0.5% to $4,400. 2) New York, NY rent had a similar trend to San Francisco’s with one bedrooms staying flat at $2,870 last month while two bedrooms grew 1.5% to $3,280. 3) San Jose, CA also had a fairly stable month in prices with one bedrooms holding steady at $2,460 and two bedrooms dropping 2.5% to $2,780. 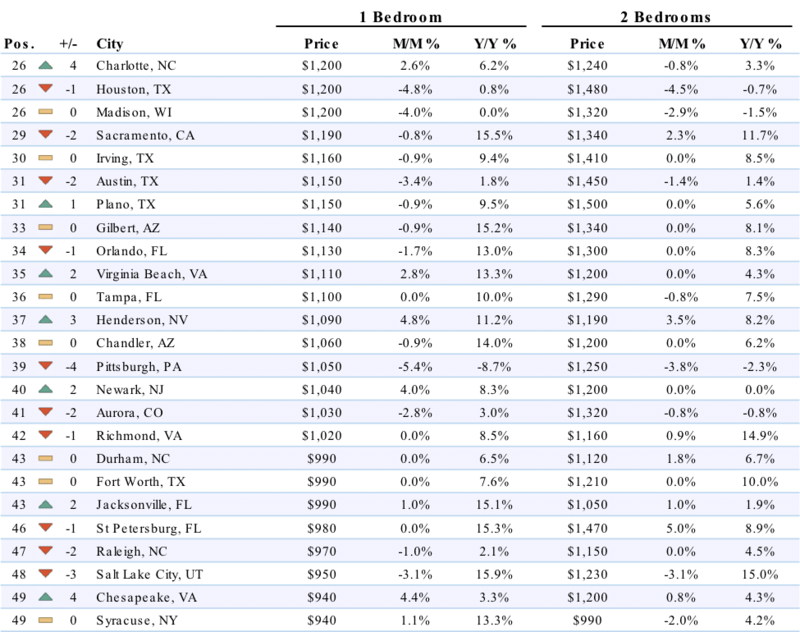 4) Boston, MA moved up two spots and into the top five markets to rank as the fourth most expensive rental market. One bedrooms grew 1.3% to $2,300, while two bedrooms were flat at $2,700. 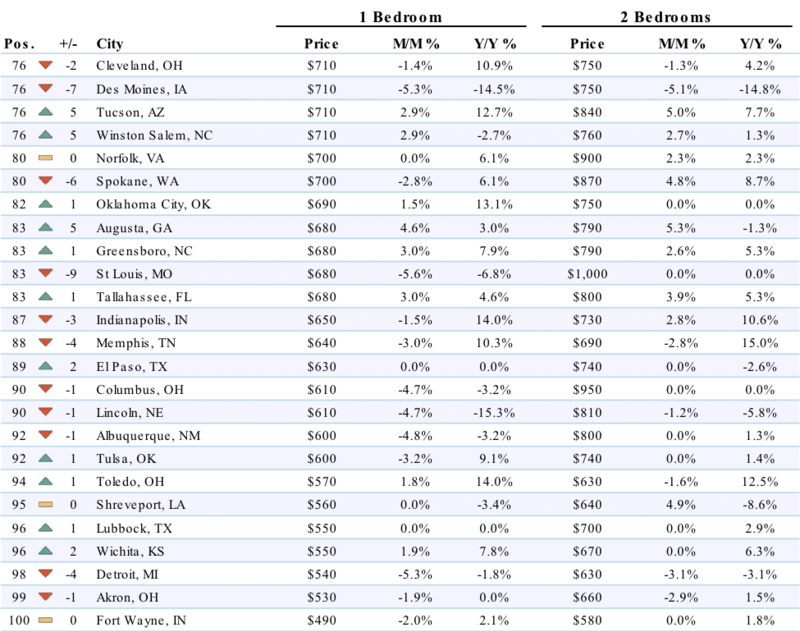 5) Washington, DC moved down one spot to become the fifth priciest city. One bedroom rent fell 2.6% to $2,280, while two bedrooms decreased 1.7% to $2,950. – Minneapolis, MN rose three spots in the rankings to become the 21st most expensive city in the nation. One bedroom rent grew 3.9% to $1,320, while two bedrooms increased 1.7% to $1,760. – Baltimore, MD, climbing three spots, ranked as the twenty-fourth priciest city. One and two bedroom rents both jumped 5%, to $1,260 and $1,470, respectively. – Charlotte, NC one bedroom rent climbed 2.6% last month, settling at $1,200, and up four spots to become the twenty-sixth priciest in the country. 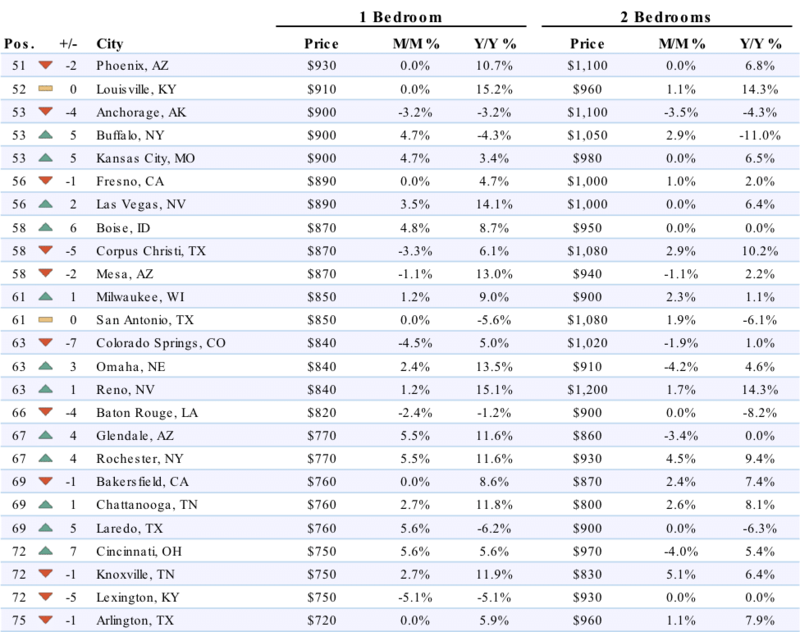 – Henderson, NV saw one bedroom rent grow 4.8% to $1,090 and moved up three spots to rank as the thirty-seventh most expensive. Two bedroom prices saw a slighty smaller increase, up 3.5% to $1,190. – Newark, NJ jumped two spots to rank as fortieth. One bedroom rent climbed 4% to $1,040, while two bedrooms remained flat at $1,200. 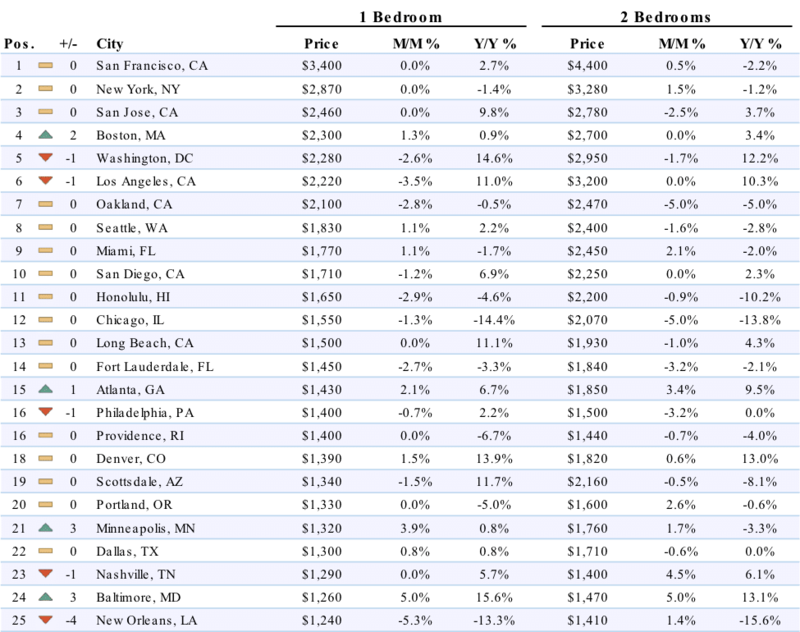 – Los Angeles, CA dropped one spot and out of the top five markets last month. One bedroom rent fell 3.5% to $2,220, while two bedrooms stayed flat at $3,200. – New Orleans, LA saw a four ranking dip to twenty-fifth with one bedroom rent decreasing 5.3% to $1,240. – Houston, TX fell one spot, now tied with Charlotte as the twenty-sixth priciest city. One bedroom prices here dropped 4.8% to $1,200 while two bedrooms saw a slightly smaller decline, down 4.5% to $1,480. – Pittsburgh, PA had another month of decreasing prices, moving down four more spots to become the thirty-ninth most expensive rental market. One bedroom rent dropped 5.4% to $1,050, while two bedrooms decreased 3.8% to $1,250. – Colorado Springs, CO one bedroom rent saw a 4.5% monthly decrease, settling at $840, and a seven ranking dip to sixty-third. Two bedroom prices had a downward trend as well, falling 4.2% to $910. ABOUT: The Zumper National Rent Report analyses rental data from over 1 million active listings across the United States. Data is aggregated on a monthly basis to calculate median asking rents for the top 100 metro areas by population, providing a comprehensive view of the current state of the market. The report is based on all data available in the month prior to publication. If you’re interested in a more in-depth explanation of how and why we calculate our rent data, view our methodology post. 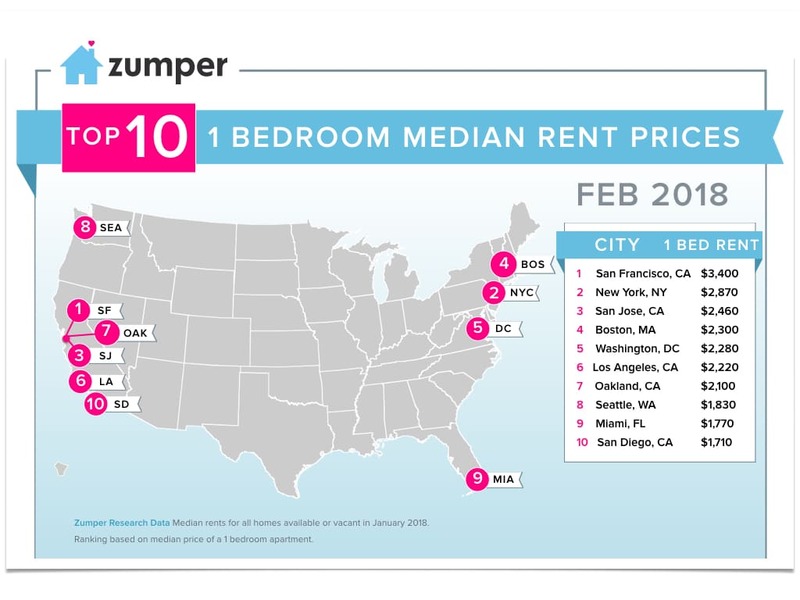 To keep up to date with rent changes across the country, like or follow Zumper on Facebook, Twitter, and Instagram. In the market for a new place? Search apartments for rent on Zumper. Written by Zumper | February 7, 2018 | © 2018 Zumper. All Rights Reserved.